Arsenal boss Arsene Wenger has praised the Football Association for taking a tougher stance on players who feign injury in order to get an opponent sent off. Under new regulations, a player who simulates an injury could be retrospectively punished with a three-match ban. 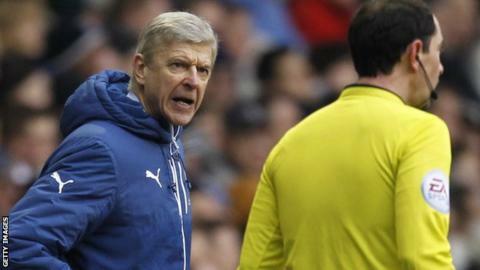 Wenger has previously called for the FA to take action against simulation. "I'm a big, big fan of the new rule," said Wenger. "With all the camera angles it will be easier to punish players diving." According to the new rules, the player deemed guilty of feigning injury to get an opponent dismissed can only be punished if the red card is rescinded by an independent panel. Wilshere injury not as bad as feared? Meanwhile, Wenger also backed midfielder Jack Wilshere to cope with his latest injury setback, and suggested he could be return to fitness earlier than expected. The 23-year-old England international suffered a hairline fracture to his right ankle after a heavy tackle during training, and was initially expected to be out for up to eight weeks. "It could be much shorter than expected, he will have two weeks in a boot," added Wenger. "He was down but we will help him cope with it. It's mentally difficult." As well as Wilshere, Wenger confirmed Arsenal will also be without Alexis Sanchez for the season opener against West Ham on Sunday. The 25-year-old forward, who scored 25 goals for the Gunners last season, completed a 58-game campaign by helping Chile to win the Copa America on 4 July. Sanchez missed the Community Shield win against Chelsea last weekend and Wenger said he still needs time to get back up to full fitness. "He came back in good shape and should be available to play in 10 days," he said. "The difficulty is to find holidays for your players. The season starts so early that you could end up with your youth team playing." Arsenal have made only one signing over the summer - the £10m purchase of goalkeeper Petr Cech from Chelsea - and Wenger played down suggestions that the club is working on a deal for Real Madrid forward Karim Benzema. The Gunners have been linked with the 27-year-old France international for much of the summer, but Wenger said: "I never came out on Benzema. It is just media talk." While there was no further news on potential arrivals at Emirates Stadium, Wenger did confirm a departure.